Through targeted exercises, Pilates strengthens and tones all of body's core muscles. Pilates challenges the student to focus determination on these muscle groups and the result, through practice, is tremendous strength. That strength is foundational to many aspects of health and well being. This may include reducing various forms of pain, an amazing new depth to your yoga practice, or the achievement of new abilities in sports and other activities. Hot Pilates is Pilates performed in a room heated to 95 degrees and 40% humidity. The addition of the heat to traditional Pilates, enhances detoxification, flexibility and concentration. 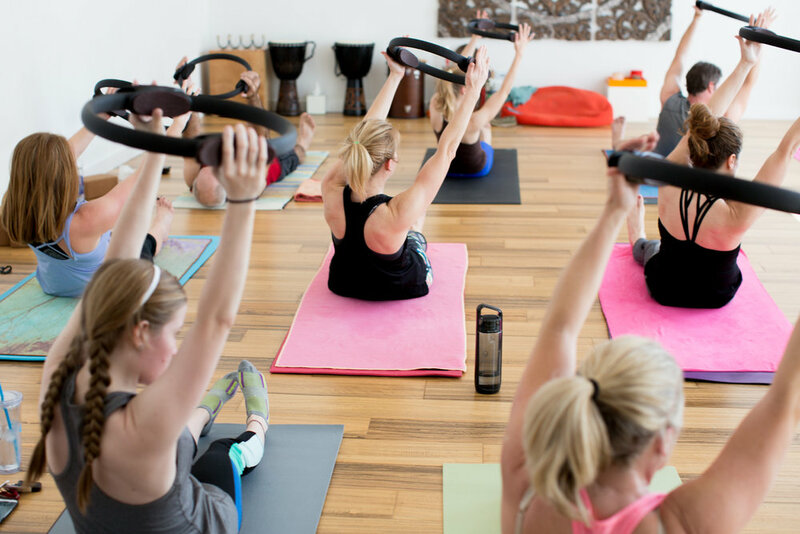 Pilates Yoga Fusion is a fast paced, upbeat class combining elements of an intermediate/advanced Power Pilates Mat sequence with an intermediate/advanced vinyasa flow for a total body workout. All levels welcome but previous experience in a vinyasa flow or pilates mat sequence is recommended.